Roy Thomas’s Alter Ego is a terrific magazine — packed with articles, interviews, and loads of art from vintage comics. So packed, in fact, that I can’t remember the last time I read one cover-to-cover. These days when a new issue arrives, I flip though it joyfully, then add it to the teetering stack to be enjoyed later. That stack finally toppled, spilling all over the floor, and while I was cleaning it up and carting it to the basement (excuse me, to the Cave of Wonders), I found a handful of issues from 2008 and 2009 I’d been meaning to blog about. 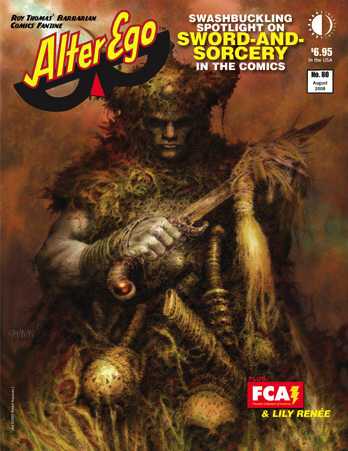 Specifically, those containing a massive three-part investigation of, and tribute to, Sword & Sorcery in the Comics. “Sword & Sorcery in the Comics” proved way too big a subject to cover in one issue… in the end, because we wanted to illustrate nearly every one of the examples of the game we were discussing, we found ourselves with only room for the S&S overview I talked John Wells into writing especially for this magazine… in Alter Ego #83, Part Two will be slashing its way toward you. After that, we’ll keep the S&S segments coming, every few issues, till we’ve covered the genre the way we’ve always intended to! We figured it’s high time. Appropriately enough, Wells begins his article with a look at Robert E. Howard and his profound influence on the entire field. In the late 1930s and 1940s, though, the general public might well have called it “that Prince Valiant stuff.” Conceived by writer-artist Hall Foster, Prince Valiant (which debuted the year after Howard’s death) was one of the loveliest things on the newspaper page, and likely as not the first place many a young reader discovered the legends of King Arthur and Merlin. There was plenty of swordplay therein as young Val grew up to take his place among the Knights of the Round Table. There was sorcery, as well, starting with the early Sunday page wherein the witch Horrit prophesied that the teenager’s adventurous life would be tempered with great sorrow and discontentment. 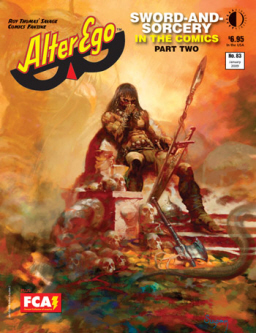 Wells covers an incredible range of titles and characters, including Crom the Barbarian, La Reina de la Costa Negra, Nightmaster, Kull, Red Sonja, Solomon Kane, Bran Mak Morn, Fafhrd and the Gray Mouser, Beowulf, Warlord, Dagar the Invincible, Wulf the Barbarian, Ironjaw, Howard the Duck, Cerebus, and yes, even Groo. The artists on display include Barry Windsor-Smith, John Buscema, Gil Kane, Bernie Wrightson, Mike Ploog, Frank Thorne, Frank Brunner, Howard Chaykin, Frank Frazetta, Jerry Bingham, Mike Grell, Pablo Marcos, Neal Adams, Joe Kubert, Jesse Santos, Larry Hama, Mike Sekowsky, and many more. Of course, that’s not all in this issue. The remaining 60 pages are given over to additional features, including pictures of the 1965 New York Comicon, Michael T. Gilbert and Mr. Monster’s Comic Crypt, 1960s Supergirl artist Jim Mooney, and a lot more. As promised, Part Two of Sword & Sorcery in the Comics arrived just a few months later in issue 83, dated January 2009. 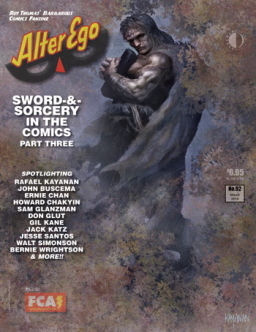 Alter Ego 92, cover dated March 2010, contains Part III of Sword & Sorcery in the Comics. Rafael Kayanan has cover duties again. Inside, Thomas and his team examine DC’s Sword of Sorcery by Denny O’Neil, Howard Chaykin, and Walt Simonson; Claw the Unconquered by David Michelinie and Ernie Chan, Charlton’s Hercules by Sam J. Glanzman; and Gold Key’s Dagar the Invincible by Don Glut and Jesse Santos. Plus there’s Marvel S&S art by Sal Buscema, Rafael Kayanan, Bernie Wrightson, and others. And Jim Amash interviews Jack Katz on his S&S classic First Kingdom. To be honest, I’m not really sure if Roy Thomas kept his promise to “keep the S&S segments coming, every few issues” after Part III appeared. It’s entirely possible, but to be certain, I’d have to make another subterranean expedition into the Cave of Wonders to pour over later issues. So I think I’ll leave that as an exercise to the reader. Alter Ego is edited by Roy Thomas and published eight times per year by TwoMorrows Publishing. Most issues are 100 pages with a cover price of $6.95. ; current issues have switched to full color and an $8.95 price tag. All three issues covered above are still in print, and you can order them directly from TwoMorrows Publishing at their website. They’re currently selling back issue for 15% off, so act fast. Hey, great post John! And I thank you for it too, as I hadn’t known about the 3rd installment in issue 92…so I’ve just purchased it! The only two Alter Egos I own are the other two. Besides the discount right now, what’s cool with the print order is that I also receive the digital version. And after looking at it, now I want the other two issues in digital as well. Leave it to John to always be influencing my spending! Yeah, I took advantage of the special pricing and got some digital (and print) issues too. Haven’t look at them yet… how do they look?